The European brand will introduce in the EMO its commitment with a more human, profitable and safer manufacture. SORALUCE is at the cutting edge of innovation in the machine-tool field. 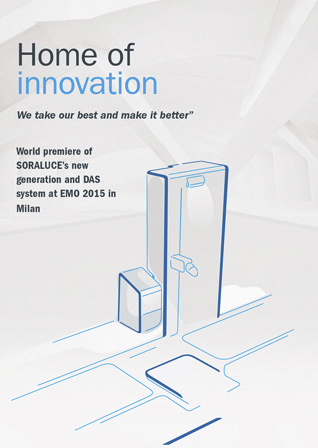 The European manufacturer is going to show that again in the next edition of the international fair EMO in Milan, introducing its new advanced solutions for machining. In this way, SORALUCE will be consolidated as Home of Innovation, due to its wide-ranging experience, extensive technological support and the opinion of its customers. With all that, a new range of machines have been created in order to revolutionize the market, thanks to the incorporation of a new design concept that emerges to give a respond to the needs of the operator with greater ergonomics and safety. In accordance with its philosophy based on the continuous improvement of its products, in the last two years this innovative manufacturer has focused its efforts on launching on the market a new generation of machines that incorporate advances never seen in this field. In the EMO, main European fair in this field, that this year takes place between the 5th and 10th of October in the Italian city of Milan SORALUCE will show at stand C20 D21 hall 1 a multifunction center FMT and a milling-boring FXR-W, examples of the great achievements that have given innovation and solutions for machining. Both machines have the new DAS system (Dynamics Active Stabilizer). System emerged thanks to the joint effort between SORALUCE and its research center iK4-Ideko and tested in Bimatec-Soraluce, technological center of the brand in Germany. This joint effort of I + D+ i , in which it is especially taken into account the suggestion of users, is depicted on a device able to increase not only the mechanical stability of the machine but also, machining performance by up to 300 per cent. This reduces the classic regenerative effect of the chatter when turning. The DAS system improves surface quality, milling capacity, it also reduces the risk of breaking tools and it increases tool working life under extreme conditions of milling. The two machines that SORALUCE is going to display in the EMO are also the reflection of a profound re-design carried out by SORALUCE in order to give greater ergonomics, safety and functionality. The European manufacturer is clear that to improve performance of machining it is important to generate a comfortable area of work for the operator. And to achieve that, it has developed a totally new concept in the design that can be seen at different levels. For instance, the new cabin of the operator includes great improvements that enhance visibility and accessibility to work areas. It has also incorporated a new electrical elevation system which requires less maintenance, ensures optimal comfort while using it and the new peripherals are safer and more accessible, which means an increase in productivity and profitability of the machine. SORALUCE adds to these developments its traditional effort to customize its machines according to each costumer's particular specifications. This is the eleventh occasion in which SORALUCE will attend to EMO, occasions in which it has always stood out for its focused solutions on reliability and profitability. The innovative DAS system and the rest of new concepts incorporated in its machines will be detailed in presentations and demonstrations held daily at its stand at 11.00 and 15.00.The European brand has extensive experience with more than 2.500 machines sold. Nearly half of them in Germany, a very demanding market. It has also been determined that over the years, 80 per cent of costumers have trusted its products again. SORALUCE is part of DANOBATGROUP, machine-tool division of Mondragon Corporation, one of the most important holdings in Europe. With more than 18 top-level manufacturing plants in Spain, Germany, England and the United States. It also has its own I+D center with 120 engineers and 26 doctors. DANOBATGROUP provides multitechnological offers that are the most complete and solid on the market. In the last five years it has kept a turnover of about 250 million euros, which has allowed it to continue with a high investment in I + D+ i, of about 6,5 per cent of its turnover.